Back before Christmas, I was window shopping (browser shopping?) 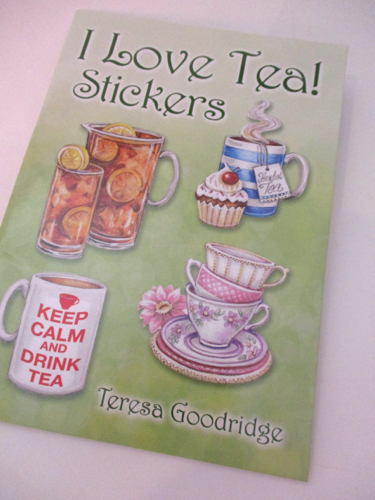 for tea books on Amazon when I noticed a new postcard-sized booklet of tea stickers was coming out. 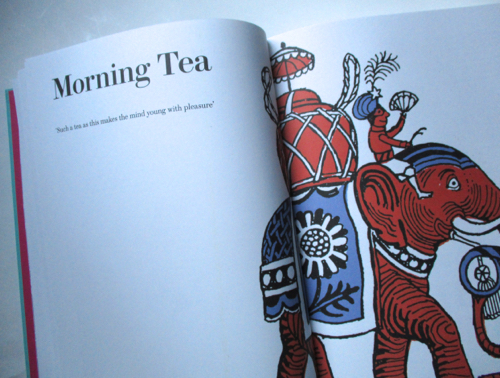 I pre-ordered it, and when it arrived the other day, I wished I had ordered a few more copies of "I Love Tea! 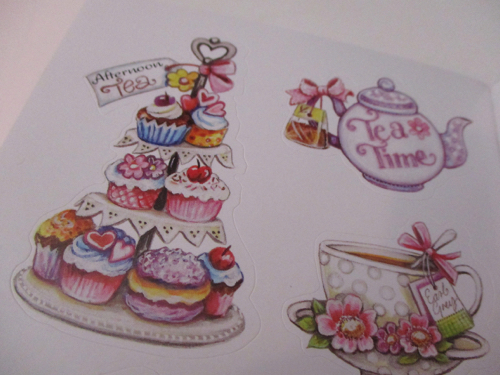 Stickers" by Teresa Goodridge. From Dover Publications, of which I have been a fan for many years, these stickers are perfect for when you stuff a card with a tea bag or some other lumpy gift and need a little extra oomph securing the envelope's seal on the back. 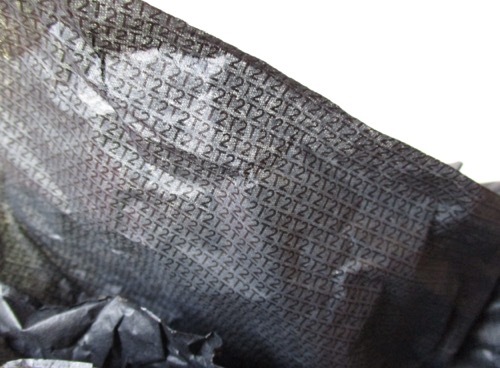 These would be great for dressing up a package as well! 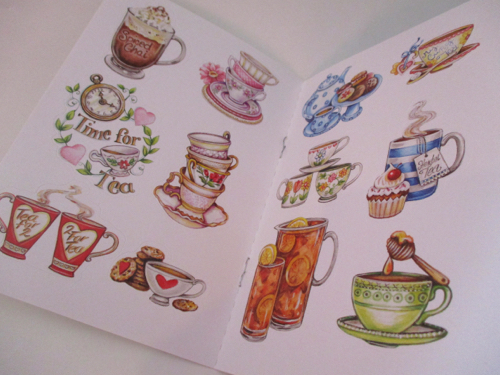 There's such a fun variety of stickers in this little booklet, and I think this was an absolutely brilliant idea for a new sticker booklet. It's just $1.99, so next time you place an Amazon order, you might want to add one of these to your electronic cart! On Saturday, I visited one of the big T.J. Maxx/HomeGoods stores, the one in Smyrna, and I was delighted at all the new teawares I found in colorful spring pastels. 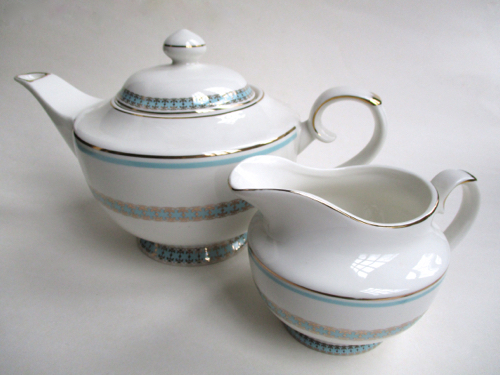 There are some really pretty new teacups, and I almost came home with one of them, but instead, I bought a new Gracie's teapot ($12.99) and creamer ($4.99). I had $10 on a gift certificate left to use, so my "set" was really more like $7.98. Not bad! I'm still in my "blue phase," I suppose, because these lovely shades of blue are so appealing to me. And for some reason, I found this simple banded design quite charming. I think it could be dressed up or down very easily, and it reminds me of china from the sixties! Here's a close-up of the detailing. 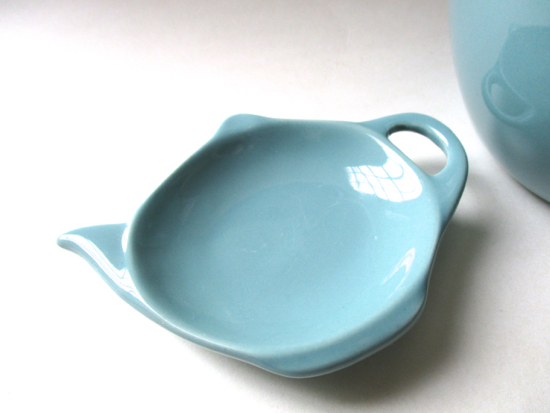 Curiously, another blue-toned design I saw had only a teapot and creamer available as well. Do you suppose someone in Smyrna is collecting sugar bowls and going around and scooping them all up? 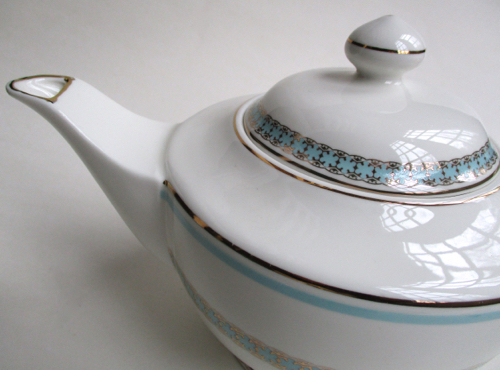 Whatever the case, I'll be going by at least three (possibly four) T.J. Maxx stores this week, so I'm hoping to find the matching sugar bowl—just in time for a little springtime decorating! Darjeeling tea remains a favorite of many tea lovers, and I was eager to learn more about it by reading this month's selection in the Tea Lovers' Book Club, Darjeeling: A History of the World's Greatest Tea by Jeff Koehler. 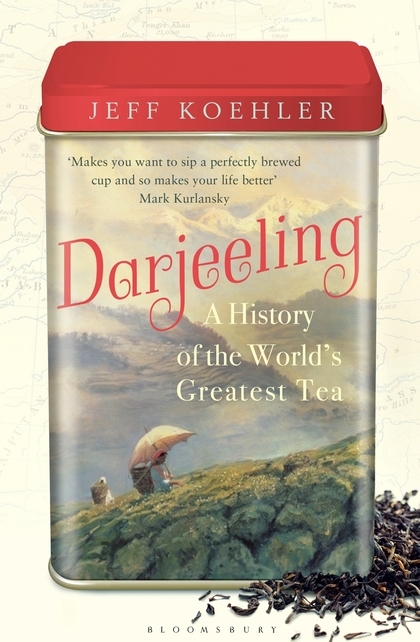 Summary: Koehler has written a wide-ranging history book about Darjeeling, approaching this tea from every angle imaginable, from its "romantic" (his word) beginning to today's very real challenges of continuing to grow Darjeeling tea in a world in which both the plants and the people who tend them are rapidly changing. • Only 87 tea estates are in Darjeeling, about 48,000 acres, which is the size of Queen Elizabeth II's Balmoral Estate. When you look at it that way, it sure seems like a small amount of tea! • The name Darjeeling itself "comes from Dorji Ling, where the thunderbolt of the Hindu deity Lord Indra—King of the Heavens, God of War, God of Rain and Storms—fell." • The pluckers, always women, take only the first two leaves and a bud, and it takes 10,000 (!) of these to make one pound of Darjeeling tea. • Mark Twain once gave a lecture in Darjeeling and stayed in the Darjeeling Planters' Club. The gist of it: I ended this book marveling that we ever came to know Darjeeling tea at all and wondering how much longer it will be around. The author says that the bushes are dying and being replaced at a rate of only 2 percent a year. 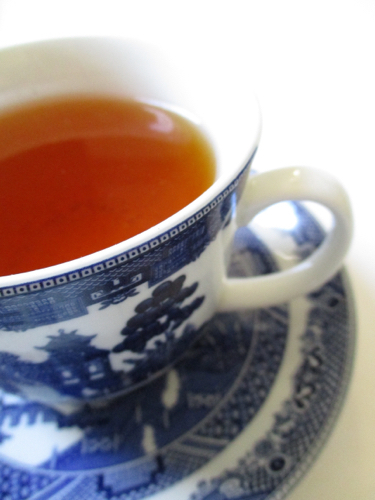 He also says that Darjeeling tea faces challenges in the areas of labor, climate, and political instability. I'd like to hear what others thought about the book. And did it make you want to run buy some Darjeeling tea before we run out of it? Our next book: I'm ready for some fiction again, so I'm suggesting something quite different for next time, a book that doesn't even come out till Jan. 30, but I'm eager to read it. 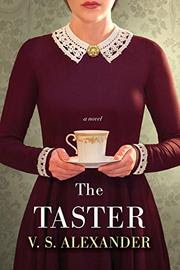 It's The Taster by V. S. Alexander, about a young German woman whose job involved tasting Hitler's meals, and early reviews indicate there's some storyline involving a plot to poison his tea. 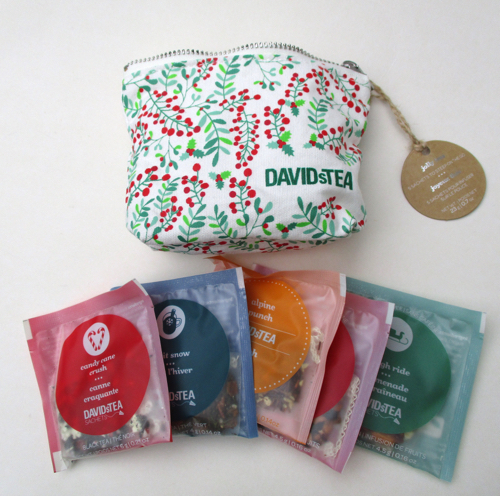 In December, I had a giveaway for one of these tea samplers from DAVIDsTEA, and I just finished sampling my own sampler and wanted to mention what a great experience I had with this company! First, their customer service was excellent (a rarity these days! 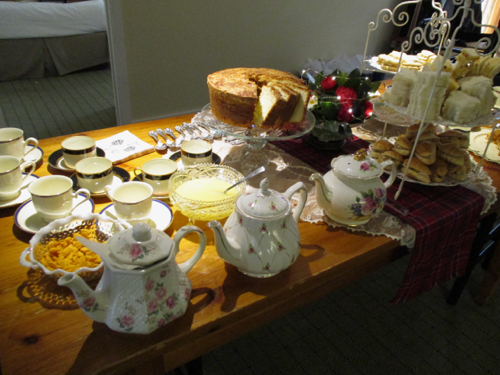 ), and second, all the teas were absolutely delicious. The five I tried were Candy Cane Crush, a minty black tea with candy cane bits and snowflake-shaped sprinkles; Let It Snow, the wonderful pineapple, white chocolate, and spice tea I enjoyed during last week's snow; Alpine Punch, a coconut-flavored rooibos blend; White Cranberry Bark, a fabulous cranberry blend (my favorite! ); and Sleigh Ride, a sweet dessert-like tea that reminded me of those cinnamon roll–flavored blends I've tried. These teas were some of the best flavored blends I've had in ages, and their packaging is so elegant, it made it a double delight to experience them. 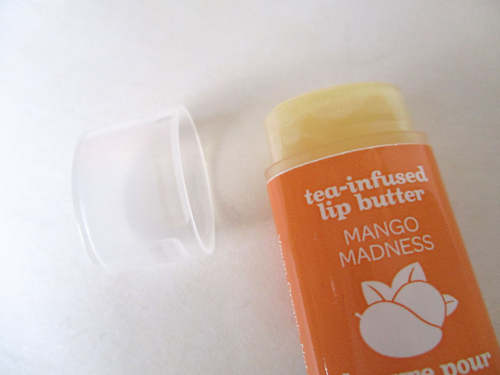 I also tried the Mango Madness tea-infused lip butter, and with the cold weather around here last week, I was reaching for it often! 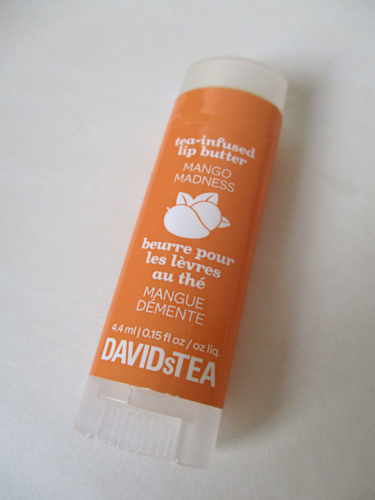 This is one of the silkiest lip balms I've ever tried, with no waxy buildup or chemical aftertaste, and I wish I'd ordered another couple of these. I'll know to do so on my next order. 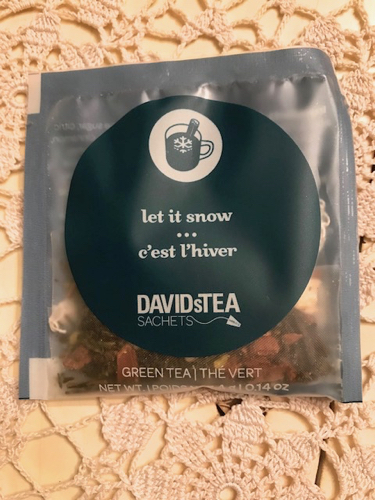 DAVIDsTEA is a Canadian company, and they often have great sales—and very reasonable shipping to the US—so if you haven't given them a try, I suggest you do so soon if, like me, you don't happen to have one of their few US stores in your area. 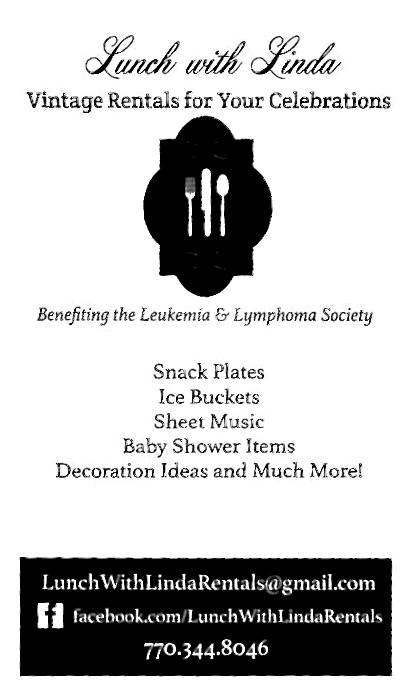 Click here now to check them out, and you can also sign up for their mailing list for a chance to win a $100 gift card! At Christmas, my friend Nancy surprised me with this wonderful sampler from Lauku Tea. Nancy is a local gift shop owner, and my theory is that this is why she has access to so many neat items, like tea gift sets, that I've never even heard of before! A visit to their website instantly had me enthralled with Lauku Tea and their Ozolini Farm, where "every petal, leaf, berry, and herb is planted, harvested, and packaged by hand." (And it's beautiful too. Get a glimpse here!) 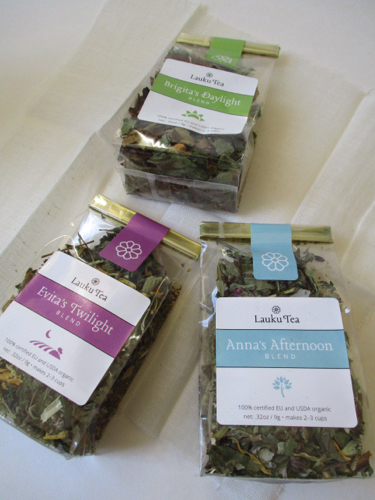 The "Latvian Sun" sampler I received contained Brigita's Organic Daylight Blend, Anna's Organic Afternoon Blend, and Evita's Organic Twilight Blend. 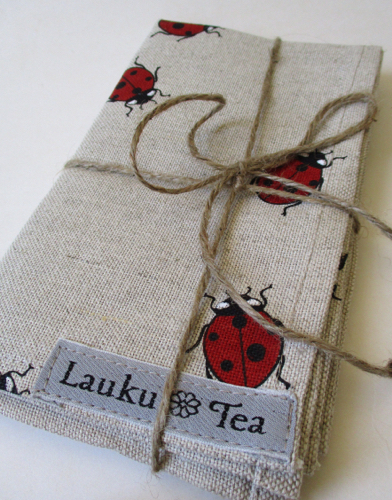 Nancy also gave me a ladybug tea towel from Lauku Tea, and since ladybugs are said to bring good luck, I was especially happy to have it! 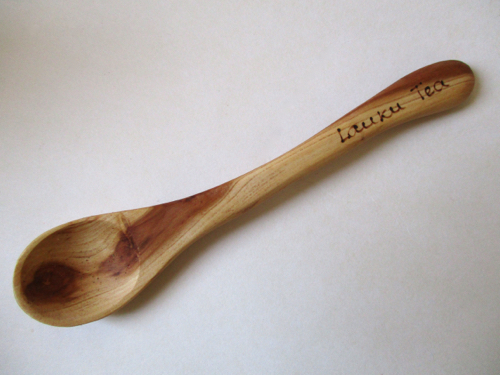 The sampler itself included an applewood teaspoon carved from the wood of the apples trees that provide leaves and fruit for Lauku's tea blends. How neat is that? 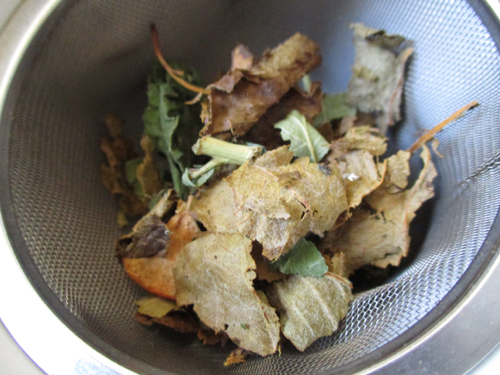 The dried leaves are huge and fresh smelling, and the first tea I tried was Brigita's Organic Daylight Blend, which contains fermented organic apple leaves, organic black currant leaves, dried organic apples, organic meadow clover flowers, organic lemon balm, and organic mountain ash berries. 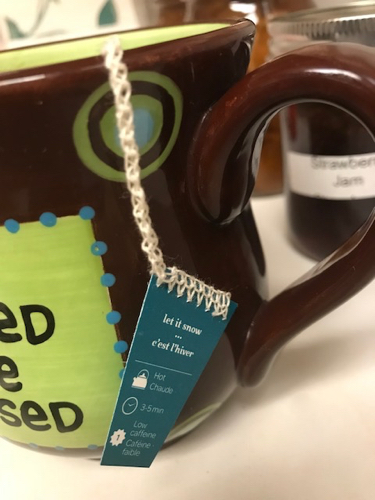 I steeped the tea for about four minutes, and I was so intrigued by the invigorating, complex flavors of this herbal tea. It had a light natural sweetness, but not like a dessert tea, and I detected a bit of a smoky note, but it was quite a pleasant one. 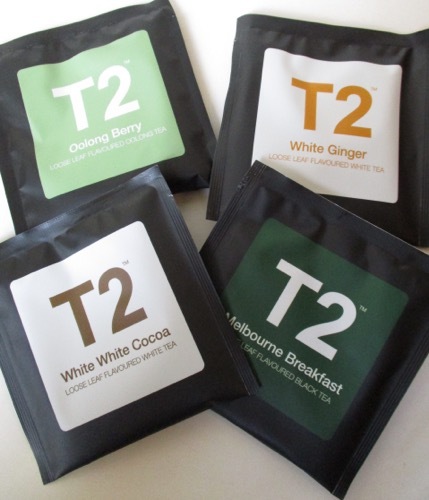 I thoroughly enjoyed my introduction to Lauku Tea and look forward to trying the other blends. 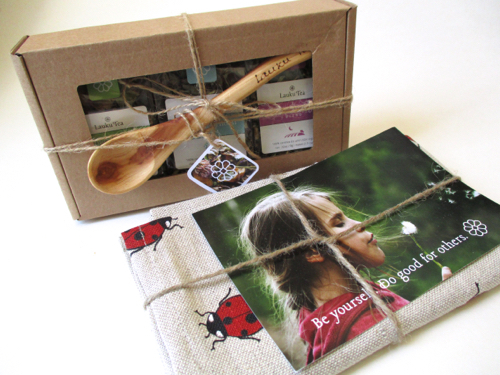 And I was also delighted to learn that even though the company is in Latvia, shipping to the US for any order is free! Click here to learn more. 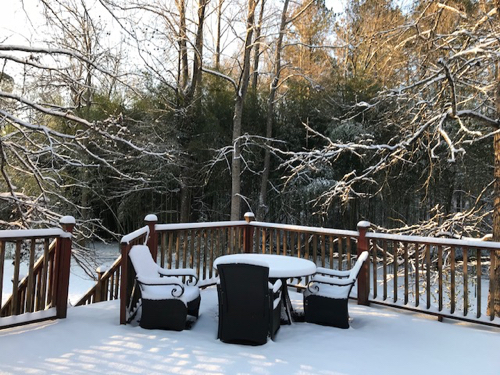 A second snow in Georgia! On Tuesday, it was predicted that we might get "a light dusting" of snow, so I was quite happy when the snow started falling that night. 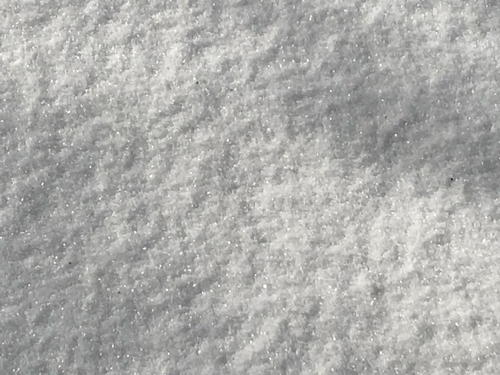 We woke up to about four inches of snow, which pretty much brings everything to a halt here in Newnan. It was lovely! Let it snow! I didn't realize that when I reached for this particular tea sachet, but my goodness, how appropriate. It's a delightfully sweet blend of candied pineapple, green tea, black currants, apple, cinnamon, white chocolate, and more. Yum! And so I'll happily say, for the second time this winter, "Let it snow, let it snow, let it snow!" 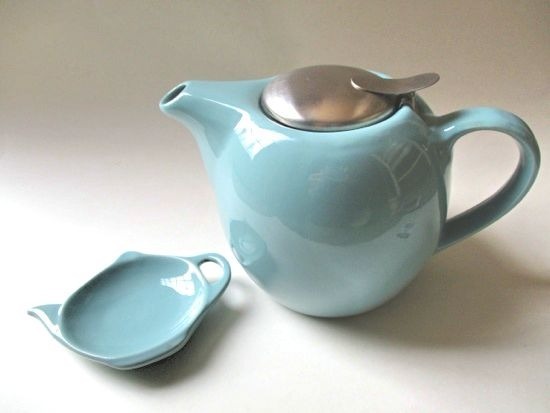 A new turquoise teapot I love! When my friend Amanda came to Christmas tea at my house, she surprised me with a gift of a pretty turquoise blue teapot and tea bag rest. I just now got around to trying out the set, and I love it! I believe she said she found it at Ross. It's marked BIA Cordon Bleu, which I had not heard of before. I don't believe I've ever had a teapot with a matching tea bag rest before, so I thought it was such a nice touch to find these two pieces that match! 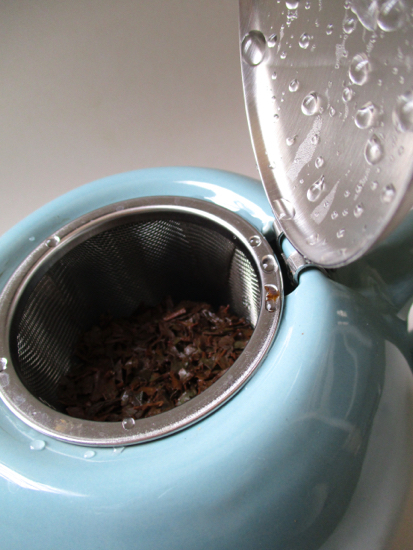 And I'm happy to report that the strainer of this infuser basket is so fine, I could even use this teapot with rooibos tea and it strained the tea perfectly. One thing I've noticed is that when I have pretty new teaware, it makes me drink even more tea. 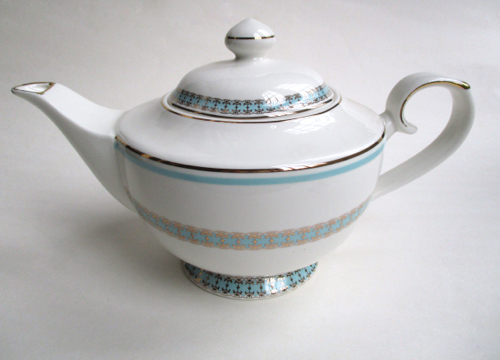 Do you find yourself drinking more tea when you get a new teapot or teacup? For several years now, Alex and his cousins (and spouses!) 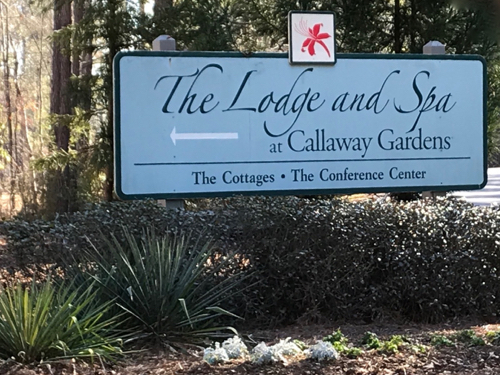 have been meeting at Callaway Gardens for a reunion. 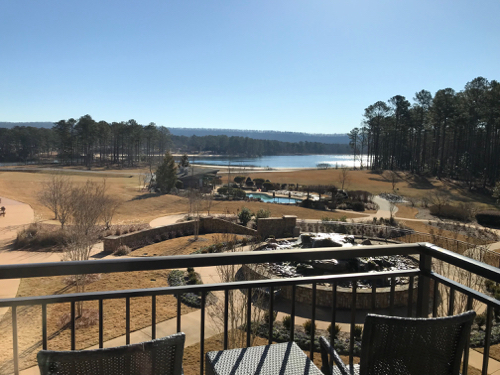 This year we stayed at the Lodge and Spa, which was a wonderful way to spend a chilly January weekend! I stepped out onto our balcony just long enough to snap a photo, and that was plenty of time in the cold weather for me! 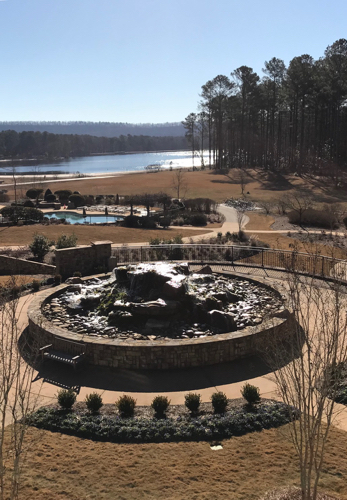 Even in January, there is lots of beauty at Callaway Gardens! 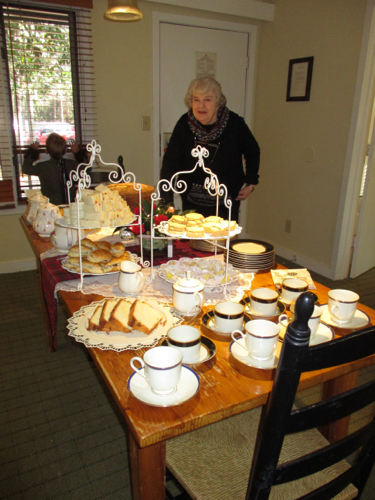 And one of the most fun things about this year's reunion at Callaway was that I was among the family members who had agreed we wanted to provide a *tea* for everyone upon arrival. Two of the cousins rented one of the cottages so that we could all congregate in a homelike atmosphere when we weren't in our individual rooms. 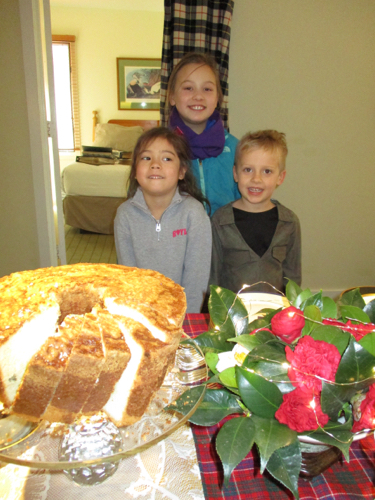 One cousin brought all the china and treats for the children, another made some treasured family pound cake recipes and decorated with her prize-winning camellias, and I brought the teas (a caramel rooibos, an Earl Grey, and a plain black tea) and finger sandwiches. It worked out beautifully, and we've already decided to do this again next year! 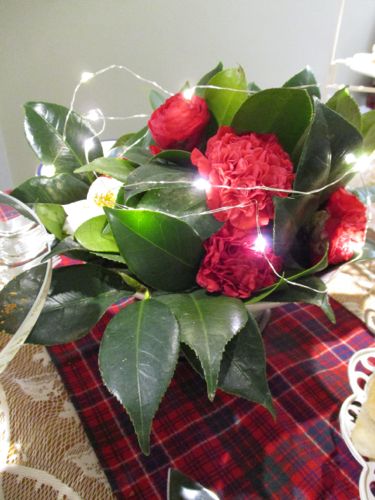 Aren't these ruffled camellias gorgeous? Here's my sister-in-law, Marilyn, and her grandson, Angus, who is eagerly awaiting the arrival of his young cousins. 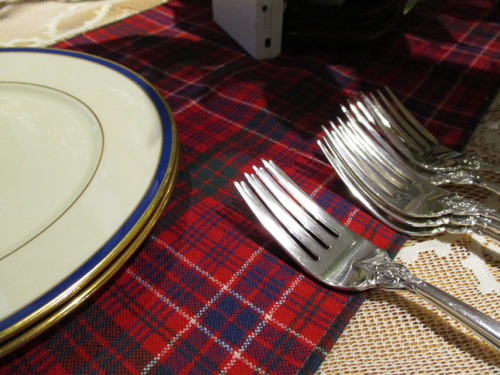 This is the McRae family plaid (and the sterling flatware that one cousin brought for the tea, a nice touch!). 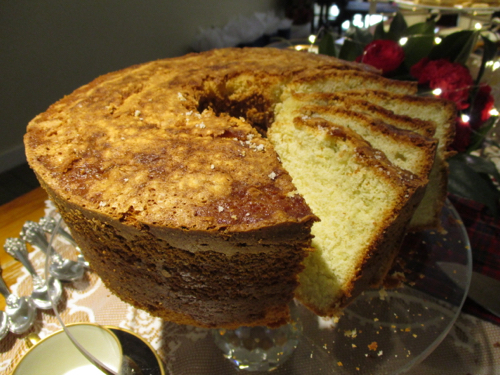 This pound cake was delicious, and it was served with a lemon curd sauce that was just amazing. I got the recipe and plan to try it myself! 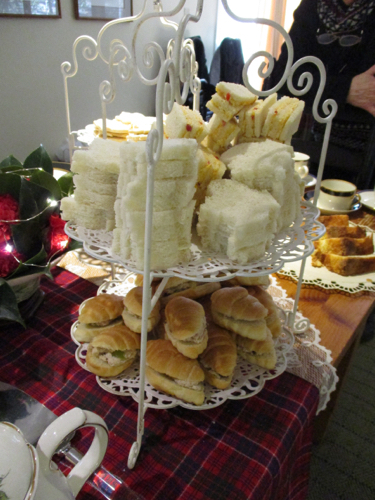 I realized I had made too many sandwiches and ended up squeezing them onto the servers, but everyone seemed to enjoy the chicken salad mini croissants, cucumber cream sandwiches on teapot-shaped bread, and pimiento cheese ribbon sandwiches. I was happy to see even the men eating these with gusto! And the rest of the pictures of the grown-ups are on other people's cameras or iPhones, but I was happy I managed to capture one of young cousins Sophie, at back, and KK and Angus. All three of them drank tea, and it turns out that Sophie and KK are big tea lovers all the time. In fact, I'm told that KK, who I believe is four, is like "a little old lady" who wakes up each morning and pads around in her old bathrobe and bunny slippers, holding out her teacup as she awaits her morning tea. And at gatherings with other kids, while they're getting soft drinks, she's off by herself and preparing her own cup of tea. Don't you love that! It was such a great weekend, and if we didn't all live so far apart—Texas, Alabama, Georgia, and Connecticut—I'm sure we'd do it much more often! This seems to be one of those weeks for sharing teatime shopping alerts! 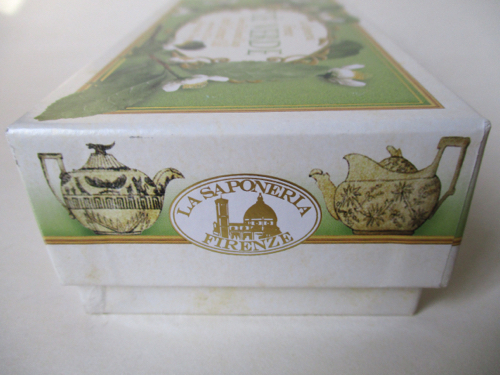 In the latter half of 2017, friends of this blog alerted me to both tea sachets and tea soaps they had found at Tuesday Morning, but my visits there turned up nothing similar. 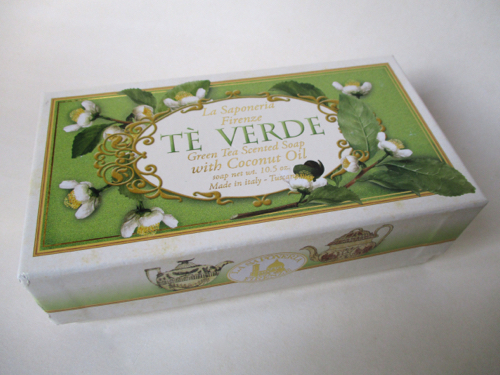 Then over the weekend, I visited the Tuesday Morning store in Douglasville and found this truly yummy Italian "Tè Verde," or Green Tea Scented Soap with Coconut Oil. It's one of those huge bars that is about the length of your hand, and oh, does this soap smell divine! It's slightly floral, slightly musky, and the combination is one that is completely new to me. While it's more expensive than grocery store soaps, I don't mind paying a little more ($4.99) for a bar like this because it will last a long time. Plus it's pretty! And to be honest, I wanted it for the box too! 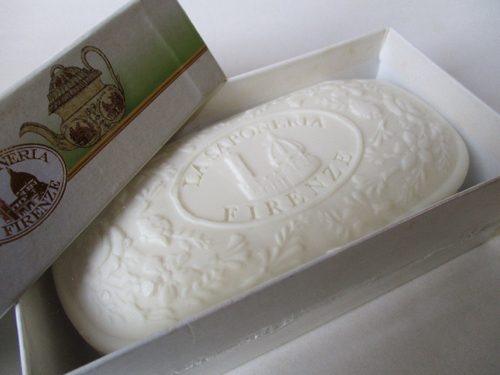 Have you seen any pretty and yummy smelling tea-ish soaps lately? 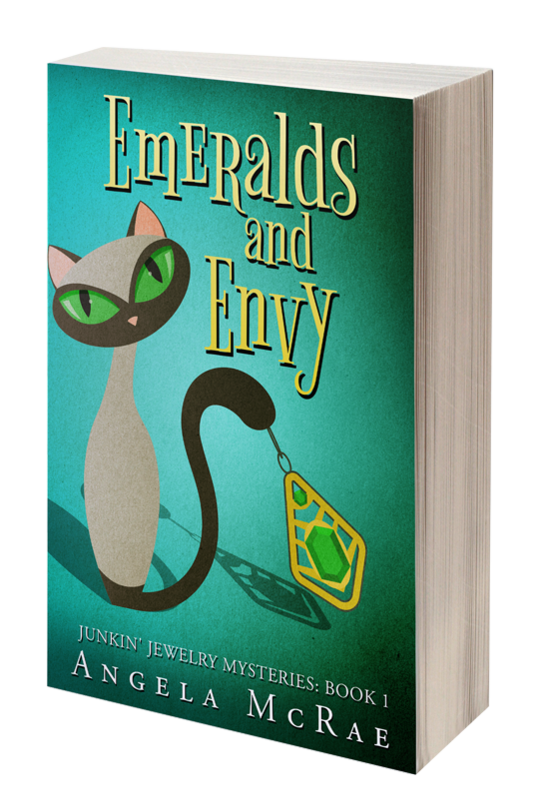 On Saturday, Aunt Jane wanted to visit Charming Charlie, a costume jewelry store at the mall. I finished checking out the jewelry pretty quickly, so I was wandering around the store killing time while my aunt looked at earrings. And guess what I spotted? 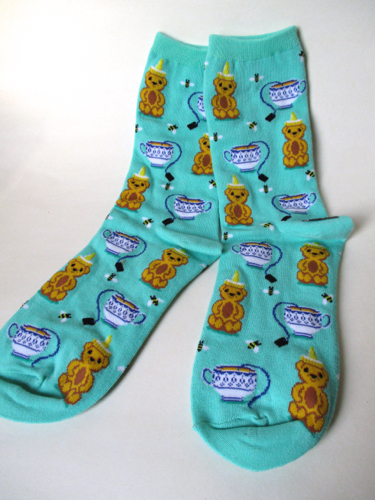 Teacup socks! Are these cute or what? They're marked $6 or 3 for $15, but mine rang up $4. Score! I just think they're cute. So if, like me, you're not a regular at Charming Charlie and happen to have one of these stores nearby, you might want to check it out! Robin Coxon! Congrats to Robin, and thanks to everyone who entered! I'm busy gathering prizes for my annual Valentine's giveaways, so stay tuned for February when there will be even more fun tea-related treats you can win! My friend Susan is one of the best shoppers I know. She is not only a great bargain hunter but also a judicious shopper who is determined to find just the right thing for each friend or family member on her gift list. She loves to travel, so I'm also very fortunate that she keeps me in mind when she's traveling and sees teas she thinks I might like. Not too long ago, I got some delicious and exquisitely packaged teas that were in her hotel room as a gift from a resort where she stayed in Hawaii. This time, I was fortunate enough to be on her mind when she was visiting Rockefeller Center in New York City right before Christmas. 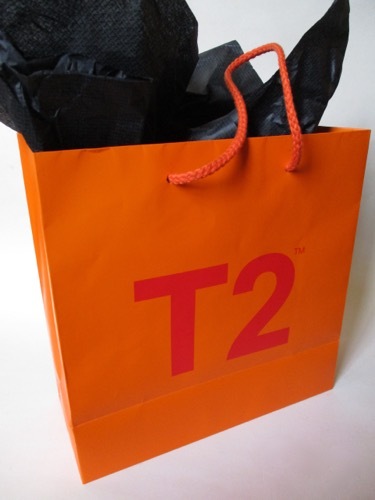 So my gift this year wasn't in a Christmasy bag, she said, apologetically—and there was definitely no need!—but she wanted me to have the bag in case I wasn't familiar with the tea company T2. I had not heard of this Australian tea company before, so I was especially thrilled with this gift and, yes, the great packaging too! She even made sure to protect the tissue since it had the company logo on it! She also did something very smart for someone who is not herself (alas for her, yay for me) a tea lover: she asked someone at the store what their top sellers were and got me a box of each! 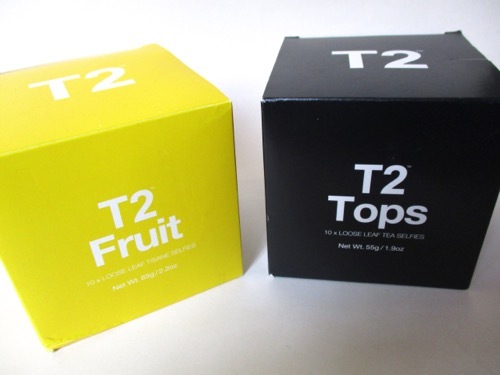 These teas are from the box marked "Fruit." These teas are from the box marked "Tops." And when I first opened a packet, expecting perhaps a tea sachet, I realized I had not actually *read* the packet, and so I quickly learned that each one contains loose leaf tea! 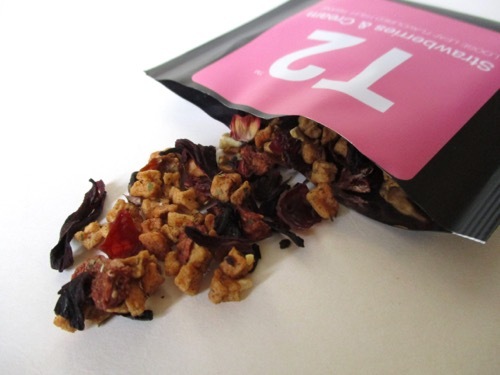 Have you ever seen individually packaged loose tea before? I have not, and I think this is simply brilliant! 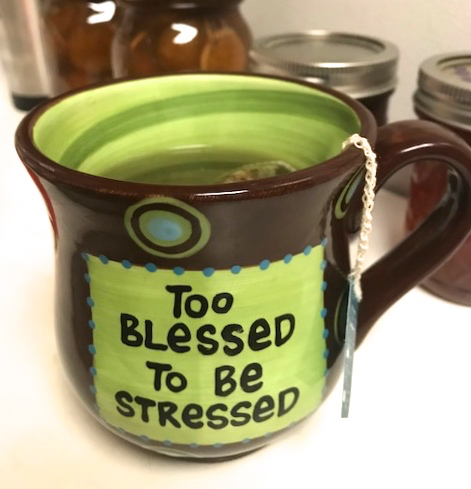 Now, I'm still trying to drink up my Christmasy blends before I slowwwwly allow myself to indulge in these lovely and delicious teas from Susan, but I can tell you that the ones I've had so far are quite delectable. I started with a wonderful chocolate one, and this is the Strawberries & Cream tisane that is the best strawberry tea I've ever tasted. 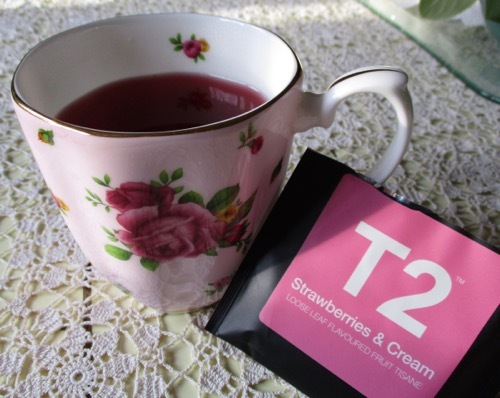 This tea had no tartness at all, and it does indeed taste creamy. 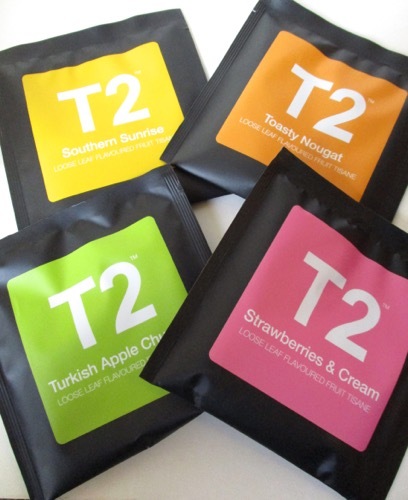 I'm so enjoying this tasty and thoughtful gift, and I wanted you to know so that you can a) check out T2 for yourself! and b) perhaps stop by the next time you're in New York City! Fortnum & Mason's "The Cook Book"
As longtime readers of this blog have heard me say quite a few times over the years, the tea- and teaware-filled Fortnum & Mason department store in London is my idea of the perfect store, so when my husband asked for suggestions for Christmas gifts, I told him I'd like Fortnum & Mason's The Cook Book by Tom Parker Bowles. (And yes, he's the son of the Duchess of Cornwall.) 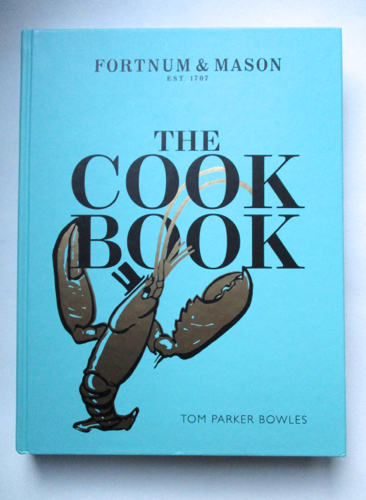 I love everything about this book, from its gorgeous cover in eau de nil, the signature blue-green color of Fortnum & Mason, to its beautiful photography and witty narratives. The recipes aren't bad, either! I was delighted to see inside the book some of the whimsical archival drawings I've seen in Fortnum & Mason advertisements before. 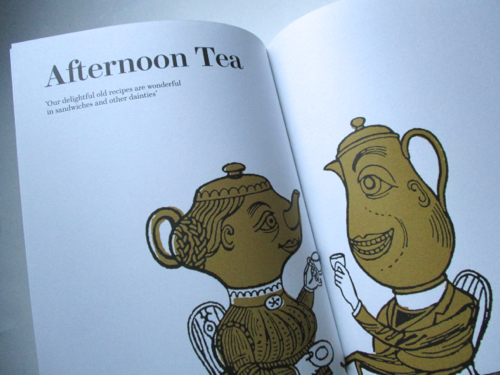 I was especially delighted when I flipped through my new book and realized it has chapters on both Morning Tea and Afternoon Tea! Were you aware of Morning Tea? I was not, and this is apparently a cup of tea served with a cookie (or "biscuit," to use their terminology). 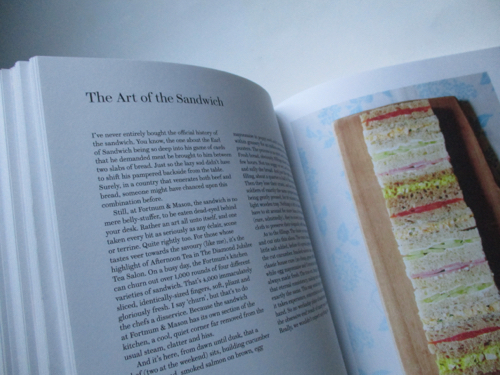 And I was irrationally happy, I suppose, to turn a page and discover a photo, preparation advice, and recipes for the very tea sandwiches I've eaten and loved at Fortnum & Mason! Here's an excerpt from "The Art of the Sandwich" page: "The process is as strict as it is unbending. Fresh bread, obviously. Fillings mixed fresh every few hours. Not too soggy or wet, as this would stain and sully the bread. And just the right amount of filling, about a quarter to half of the sandwich. 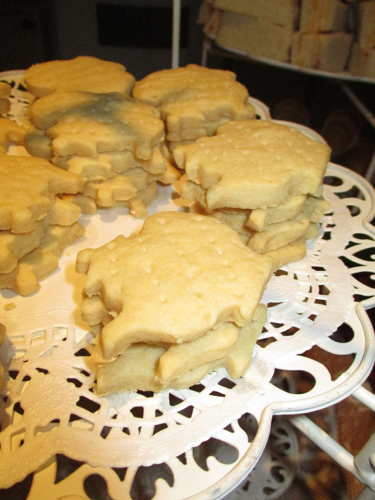 Then they lose their crusts, and are sliced into soldiers of exactly the same proportions before being gently pressed, for 30 minutes, beneath a light wooden tray. Nothing is left to chance." Who knew! 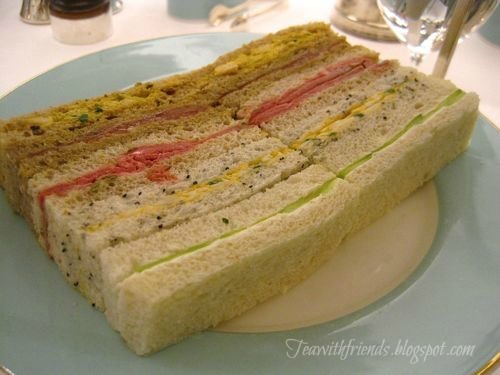 These are the sandwiches I had at Fortnum & Mason on my 50th birthday in 2014, and indeed, they look as uniform as the ones in the book. The sandwich recipe I'm most pleased to have is for F&M's Coronation Chicken, as I plan to make this when Prince Harry and Meghan Markle wed this year! 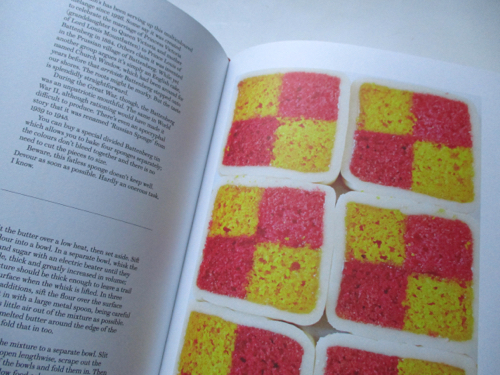 And I'm suddenly interested in ordering a Battenberg cake pan so I can make one of these beautiful cakes! I can see I'm going to have a lot of new recipes to try out in 2018. 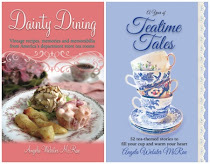 For fellow Anglophiles interested in some new "Morning Tea" and "Afternoon Tea" recipes, I highly recommend this book!